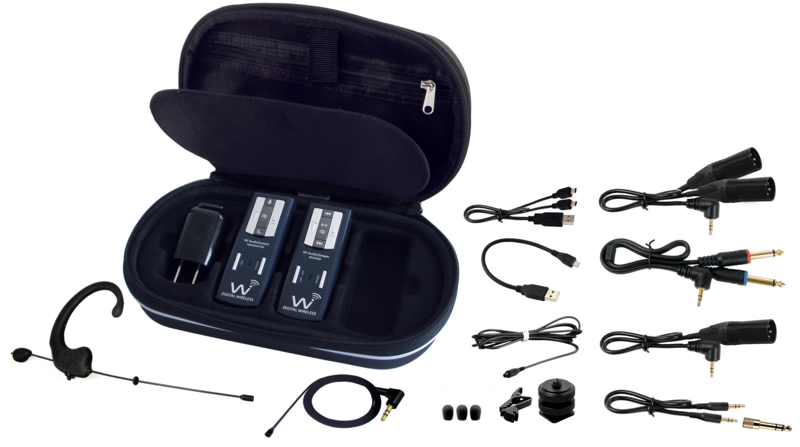 The Smallest, Most Advanced, Pocket Portable, Stereo Digital Wireless Earset, Lavalier & Audio Monitoring System For Live Performance, Video Camera, DSLR, Digital Recorders and Smartphones with Built-in 2-Way USB 2.0 Wireless Audio interface for iPad, Windows Surface, TabletPC, MAC & PC Connectivity. 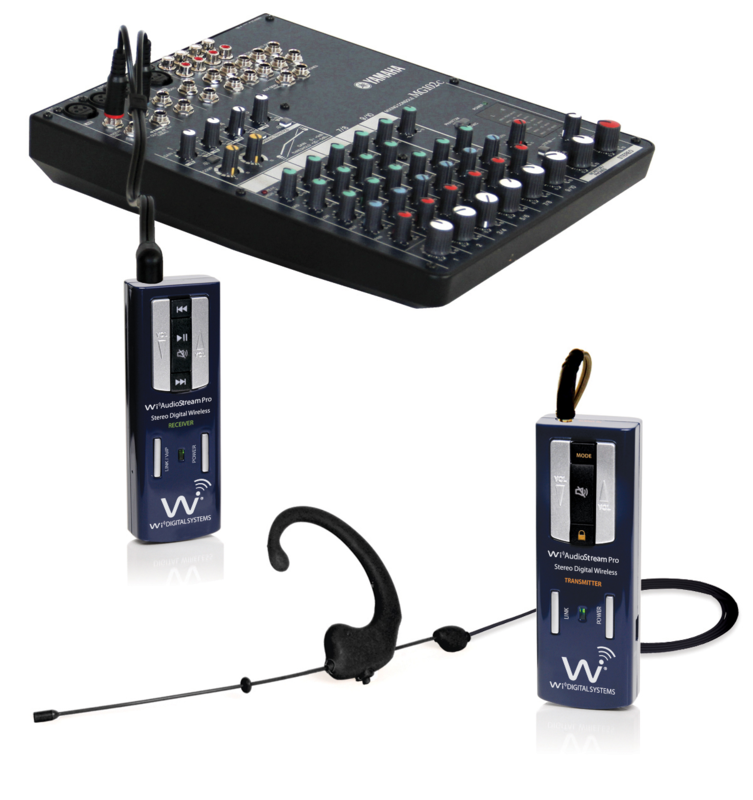 The new Wi AudioStream Pro EL 2.4GHz true diversity pocket portable stereo digital wireless microphone and audio monitoring system redefines the wireless experience for professionals who demand high quality audio for live performance, extreme portability and uncompromised universal audio connectivity to match today’s digital gear. 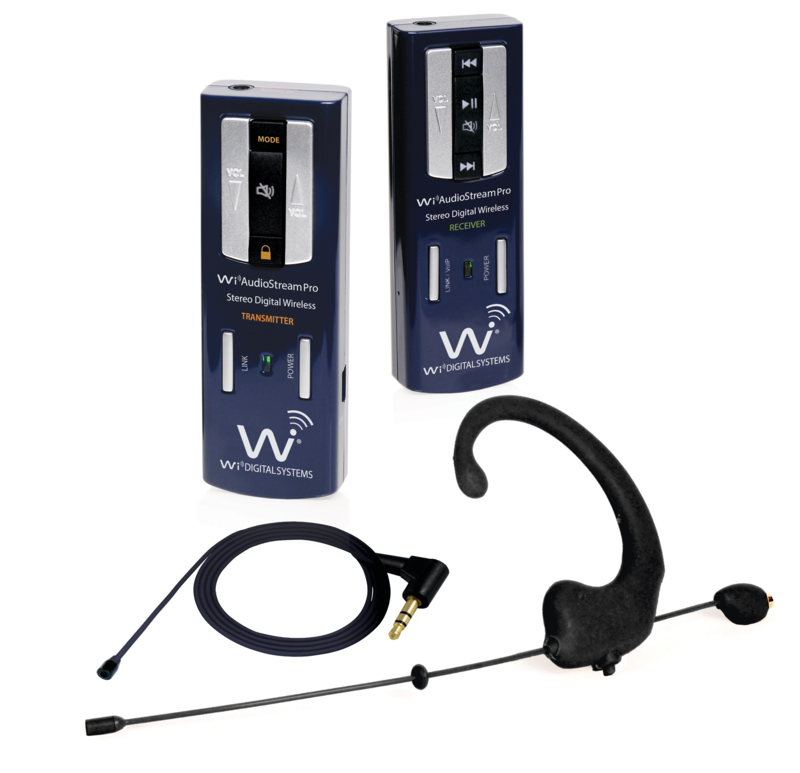 Equipped with premium cardioid and omnidirectional microphones, this wearable system quickly interchanges from an Ear-worn to Lavalier MIC or audio monitoring system with a simple swap of accessories while providing up to 100 feet of secure, uncompressed 16bit, 48kHz CD quality, wide 15Hz to 20kHz frequency response wireless audio connectivity without radio frequency (RF) interference, signal loss, or crackle inherent in UHF/VHF systems. The entire system can fit into the palm of your hand! 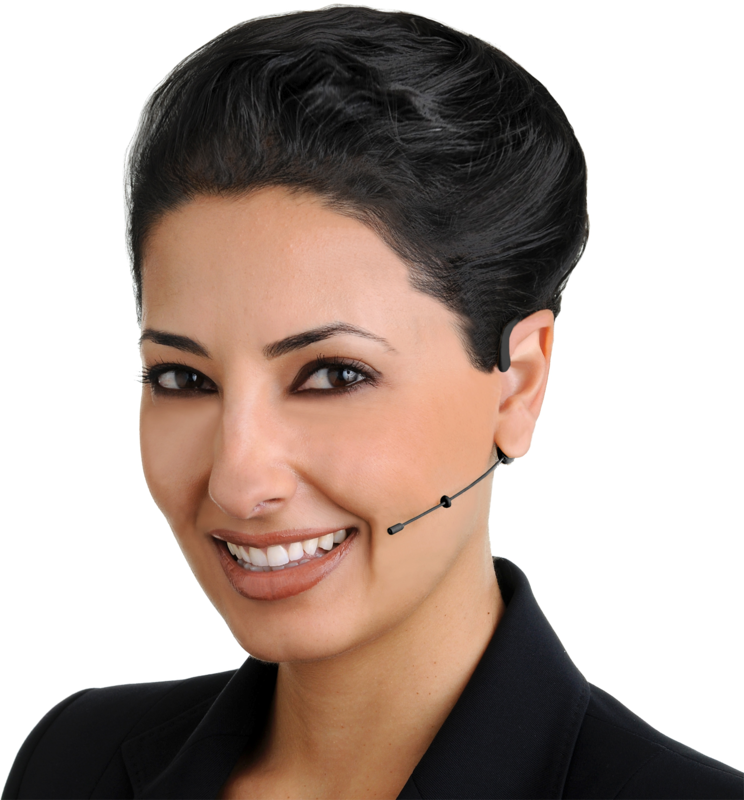 Superb Performance - Professional Grade - Nearly Invisible Microphone System. 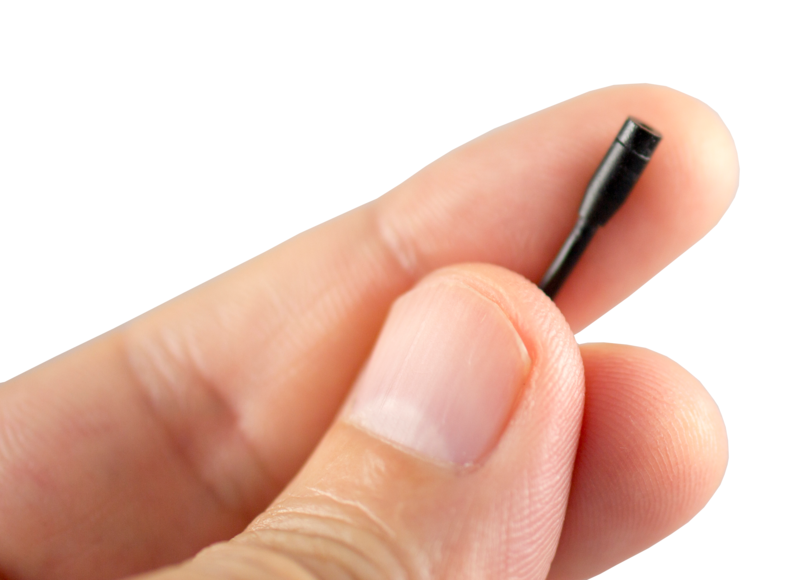 Designed for active and energetic users, the included high-end professional grade, ultra-thin, Wi Sure-Sound earset cardioid microphone easily accommodates alternative mounting applications such as left and right earset ear placement and can be adjusted to capture the closest near-the mouth vocals clearly and consistently while keeping the boom securely in place even when the head moves. Measuring 0.12 inch in capsule diameter, the superb Wi Sure-Sound omnidirectional, 20Hz -20kHz, 140 dB SPL max stereo unidirectional microphone capsules lets you capture superb vocals and amazing ambient sounds easily and accurately. 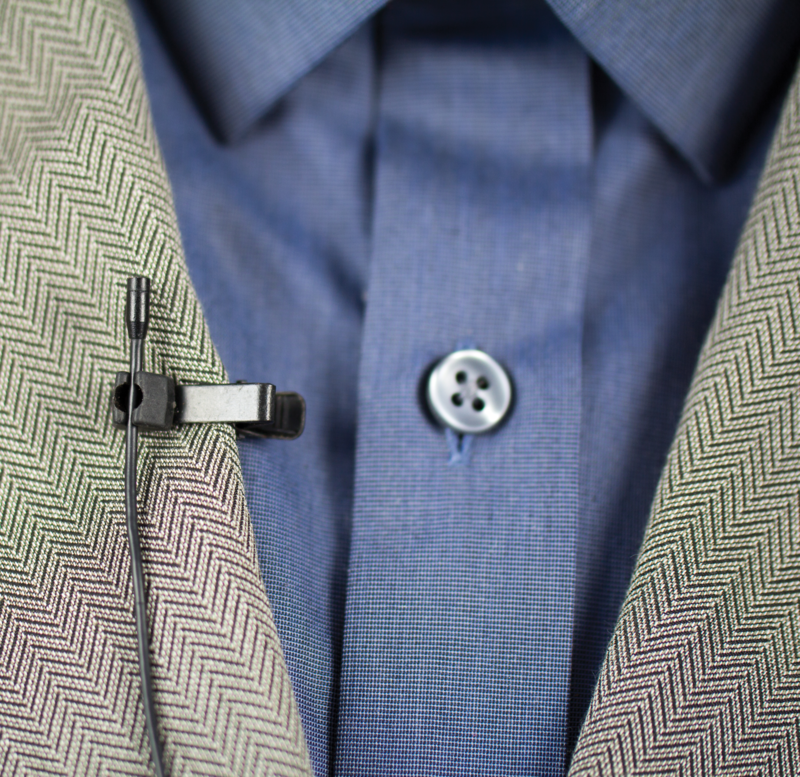 The ultra-thin lavalier easily accommodates alternative mounting applications such as ties, shirts and more.. lavalier is engineered to provide extreme cable strength and moisture resistance with exceptionally low handling noise and rugged construction. 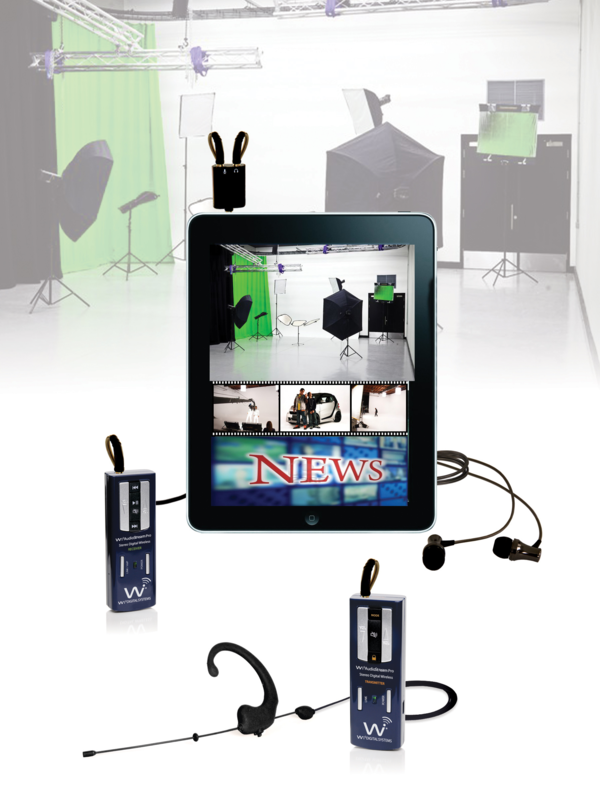 Ideal choice for theater, broadcast, church, and general lavalier applications. The Wi AudioStream Pro EL brings the much sought after digital wireless miking to smartphones and tablets to transform these smart devices to powerful On-The-Go Audio-Visual production tools. 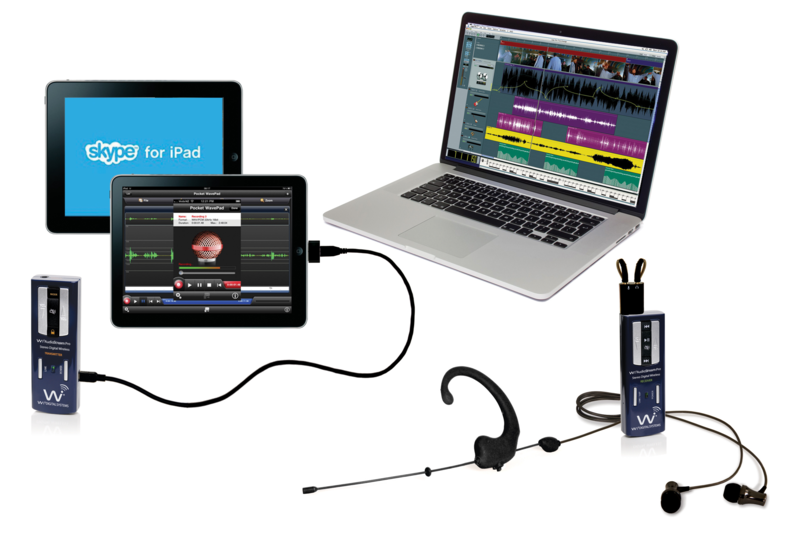 This powerful system enables users to wirelessly connect an earset or a lavalier microphone and capture superb vocals and amazing ambient sounds easily and accurately on iPhone, iPod, iPad, Windows Surface, Tablet PC or any Smartphone. Designed from the ground up to provide the elegance of wireless freedom to professional in-ear personal monitors and conventional studio monitor headphones with exceptional sound experience - And of course, the sound that made Wi Digital Systems famous - brilliant instrumental sounds and vocals with crystal clear high notes, defined midrange, and incredibly rich powerful low end that will satisfy the most discerning professionals and audiophiles alike. 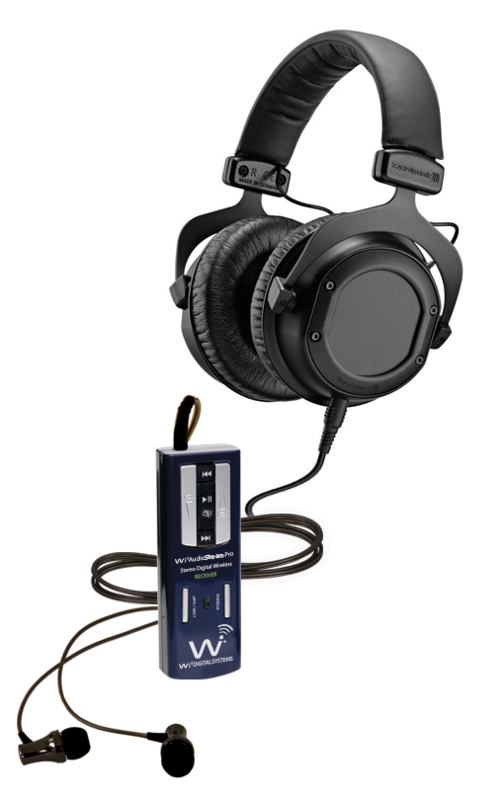 The revolutionary Wi AudioStream Pro’s 2-Way wireless USB 2.0 audio interface enables users to wirelessly connect a microphone and an in-ear monitors to iPad®, Windows Surface® & TabletPC, MAC or PC computers for pristine, uncompressed, simultaneous two-way digital wireless audio connectivity. Simply plug the Wi AudioStream Pro EL Transmitter/Transceiver to the USB port on your iOS, Windows Smart-Device, MAC or PC, then plug Microphone and Headphones/In-Ear Monitors into the Receiver/Transceiver and launch your favorite recording software, App, or any Core Audio compatible application to play, record and monitor your sound. That's all there is to it. The possibilities are endless! - Enjoy uncompressed, pristine true digital USB audio streaming and monitoring with all of your computer’s essential audio controls, including volume, mute, track control, in the palm of your hand. Ideal for virtual instruments, audio listening applications. The Wi AudioStream Pro EL allows you to conduct web conferences and voice chats over the internet with support for most common calling applications including Webex®, GoToMeeting®, Skype® and more. 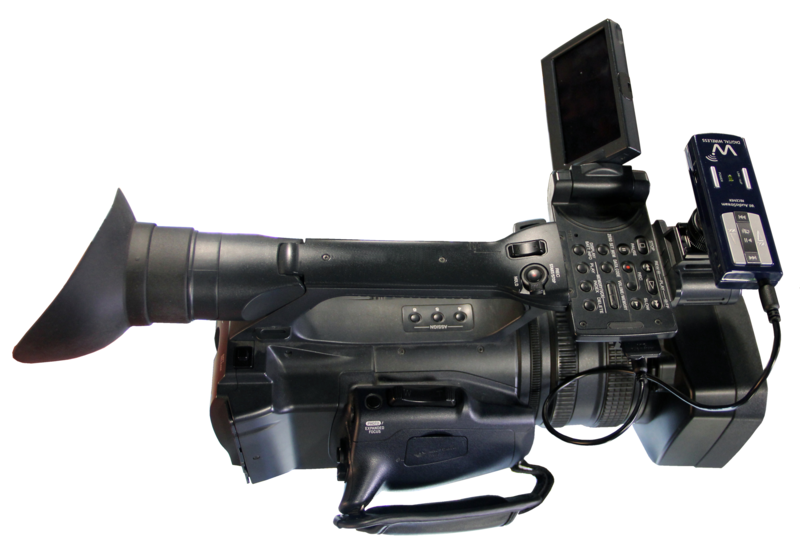 Perfect tool for educational and corporate environment applications such as recording lectures, seminars, presentations, podcasting, online instructions and more. 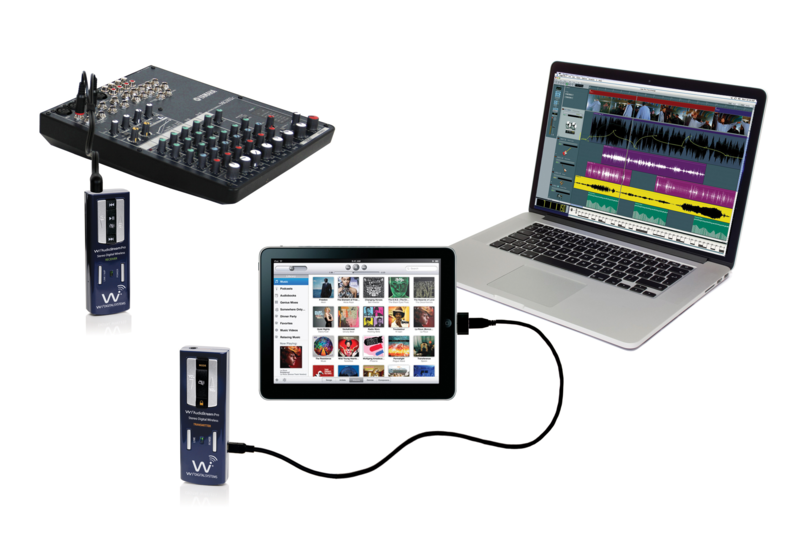 The Wi AudioStream Pro’s fast, plug-and play, USB 2.0 stereo digital wireless audio interface combines all the features required for professional wireless stereo audio connectivity for MAC, PC, iPad®, Windows Surface® and Tablet PCs on-stage, in-studio or at home with simplicity, ease and elegance. No drivers are needed! Designed to look, feel and fit like no other wireless system, the compact and ultra-light 1.08 Oz transmitter and receiver are incredibly easy to wear and can be attached to belts, shirts and pants’ pockets without impeding body movement. 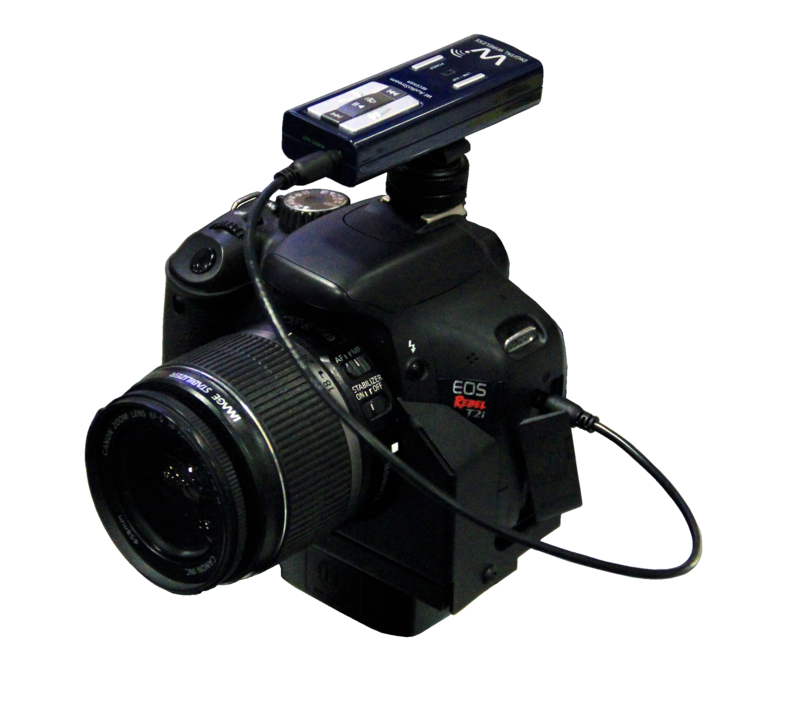 Engineered with super strong, universal mount, metal belt clip with 1/4”-20 screw mount, the transmitter and the receiver can securely mount on a variety of camcorders, DSLR cameras, or other A/V gear using the included hot shoe adapter. The Wi AudioStream Pro EL power source’s flexible design boasts an internal rechargeable battery for 4~6 hours of battery operation. Add the standard USB AA battery adapter for up to 13 hours of extended use. No need to power down the system to charge or replace the batteries. There’s also an AC power adapter for continuous operation. You can even use USB bus power to charge and operate your Wi AudioStream Pro. Enjoy true freedom from power concerns. This combination of audio performance, simplified setup, portability and all inclusive accessories needed for recording and monitoring your sound feed lets you set up quickly and easily! Dimensions 1.2" x 0.6" x 3.34"
With 2-Way Wireless USB Audio Interface. The User Manual provides detailed information about the product and step by step installation and setup instructions. The Quick Installtion Guide is a quick step-by-step tutorial that provides a basic overview and highlights key features to get you up and running fast! While not a replacement for the User Manual, this is a friendly "hands on" guide that provides a good place to start to get familiar with this unit.